We make a lot a of use of coupons. 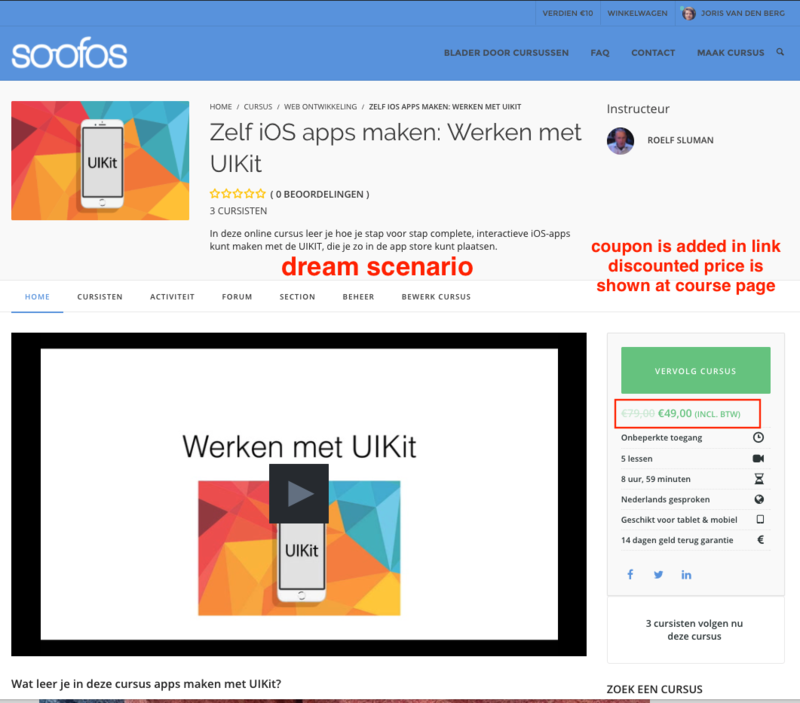 You have this very nice feature that you can add a coupon in a link. By adding /?coupon-code=nameofcoupon a coupon is automatically added. However, the price is only discounted at the checkout page. What i would like is that the coupon (when it is discounted on product not on cart) gets discounted on the product page. At present the price is only discounted at the product page when there is a general discount set for the product via woocommerce - products. However I want to give discount only to people that use the link with the coupon code and show this discount on the product page. Thus, dream scenario. My product costs €100 and i have a coupon called sjfo93 that gives €20. When I click on the link -/?coupon-code=sjfo93. I get directed to the product page and see the discounted price, which would be €80. I am using the WPLMS theme, so I don't use product pages but I have course pages. However, I believe that the price on the course page is fetched from the product page. I have added an image to clear it up. Hope it is clear enough. Would be great if you can assist me! Let me know if works for you. This should work on product page, but may also work on WPLMS. I'm not sure how WPLMS is showing the price. Thanks for responding! I tried the code, unfortunately it does not work. 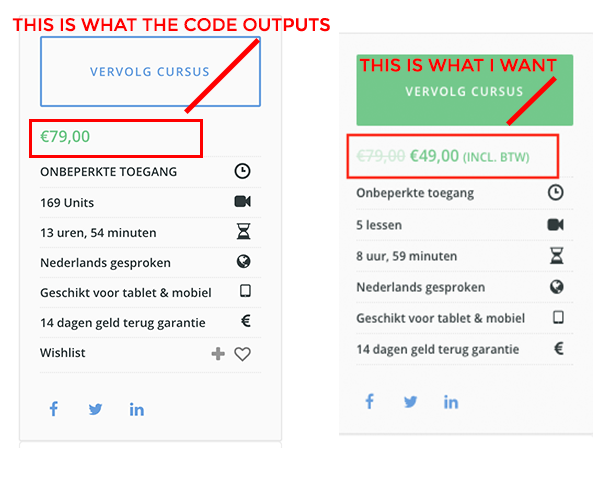 When I add it to functions.php the course page (also product page) are not fully shown any more they are cut of from the point that the price should be shown. Also when I am in the backend I can only see 1 product in woocommerce - products. did you copy the whole thing? you should just copy right after the first line where it says "<?php // <-- be careful when copy pasting.."
can you add the code now, and also, can you give me a coupon to test? I want to see it to debug further. Weird. I have a friend who has this theme. We tried the code and it works. I'm not really sure why it's not working on your site. I think your woocommerce is not the latest? We run 2.6.4, could that be too outdated? You can use the second one. OK nice, I tried and this was indeed the issue. - bigger issue, what i am really looking for is that the coupon is only applicable to selected products. However when I select only one product to be applicable the coupon does not work anymore. This is because this option in the coupon settings looks whether the product is added to cart. As it is not added to cart this does not work. Any idea on how to fix this? did you use the "$price = $_price;" or my updated snippets? If you're using my updated snippets, the "notation" shouldn't be a problem. On your bigger issue, yes that's kind of a problem. I'll try to see if we got a way around it. I'm not sure if we have a way around your bigger issue. I don't even think that /?coupon-code=nameofcoupon works on that. I figured this. If you add in the url ?add-to-cart=productid&coupon-code=nameofcoupon. It actually works. I thought it may add the product two times to the cart but this actually does not seem to happen, so quite nice solution i guess. I used the updated snippet on your site! BTW thanks for the great help so far, absolutely amazing!! about the notation, I'm not so sure what you mean. Maybe provide a screenshot. Sorry, I really don't have setup for WooCommerce 2.6.x. And downgrading from 3.0 is not an option. The latest WooCommerce uses different database format. I mean that the regular price disappears when the discounted price is shown. I would like to show the regular price with a strike through. Hope the screenshot clears it up! please remove line 38 and line 40 - 48.
line 38 and line3 43 - 48 I mean..
line 38 and lines 43 - 48 I mean.. It FREAKING WORKS! I just implemented it at our live domain and it looks like it is working as a charm. Thanks a million for the great help and quick feedback! Really appreciate it, all thumbs up! I too want to know, sorry!